Physicists find that high winds pummel all forests equally. (Inside Science) -- Philosophers will continue to debate whether a tree falling in the forest makes a sound, but a new study by physicists could explain why that tree fell in the first place. Combining experiments and mathematical modeling with data from a severe storm that brought down large numbers of trees, a team of physicists found that wind speed is the most important factor in determining when trees break, far outweighing species, size or age. Commercial forest managers have long needed to know how and why trees break, to decide what species to plant and when to harvest them. And with climate change likely causing stronger storms in coming decades, understanding under what conditions trees fall has become even more critical. To look for answers, physicist Alexandre Ponomarenko and colleagues at École Polytechnique in Palaiseau, France studied data collected during Cyclone Klaus, a powerful 2009 storm that devastated forests throughout southern France. The physicists were intrigued that the probability of a particular tree breaking in the storm correlated strongly with the maximum wind speed that tree experienced. In places where winds topped 94 miles per hour—speeds seen in Category 2 hurricanes—most trees broke, regardless of whether they were pines or oaks, the two main tree types in the part of France they studied. Where winds stayed below around 45 miles per hour, almost no trees snapped. The scientists hypothesized that at low wind speeds, a tree trunk can flex, but when battered by high enough winds, the trunk bends past a certain "critical" curvature and breaks. To test their hypothesis, the researchers conducted experiments that mimic how wind hits the tops of trees in a forest. Using a setup similar to ones that Leonardo da Vinci and Galileo used centuries ago to study how wooden beams fracture, Ponomarenko and his colleagues clamped rods of beech wood and pencil "lead"—actually the carbon-based compound graphite—at one end and hung weights on the other, creating a force that bent the rods. The scientists then increased the weights until the rods snapped. 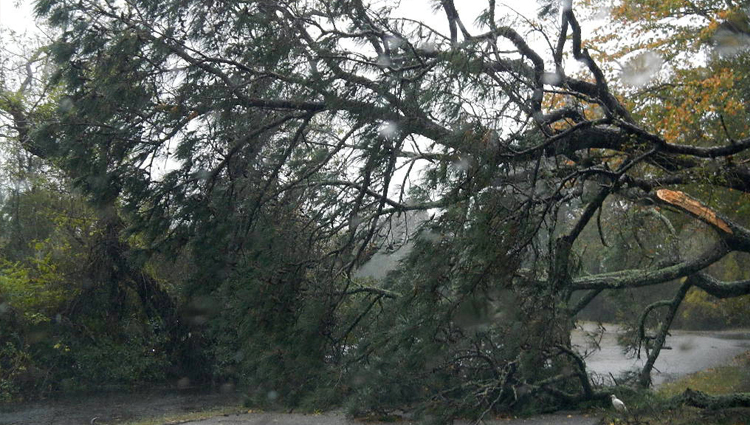 The researchers used their results to write down an equation describing how the critical wind speed needed to break a tree depends on the tree's height, diameter, and properties such as resistance to internal cracking. They found that variations in trees' dimensions or internal characteristics had little effect on the critical speed, which turned out to be close to the 94 miles per hour they had derived from the Klaus data. The reason, says Ponomarenko, is that as a tree grows, factors influencing its vulnerability to breaking mostly cancel each other out. For instance, larger, older trees are more likely to be weakened by internal defects in the wood, but a tree's diameter also roughly triples every time its height doubles, making the trunk stiffer and less likely to snap. The work is the first to describe how all trees break with a single equation, said Barry Gardiner, a forest meteorologist at the National Institute for Agricultural Research in Bordeaux, France. "There are other people that have taken a quite similar physical approach, but haven't pushed it as far…as these guys have." But Gardiner noted that in order to obtain their single equation, the study authors made several unrealistic simplifications. Real trees, unlike wooden rods, have branches and leaves that also get hit by wind, and wood strength varies from bottom to top and interior to exterior of a tree trunk, as well as among species. For such reasons, scientists studying forest damage in other storms have found that size and species do affect how likely a tree is to fall. The authors' experiments didn't account for differences between live trees and dead wood, added Bruno Moulia, an expert in tree biomechanics at the National Institute for Agricultural Research's center in Clermont-Ferrand, France. Living trees continually repair cracks that occur in their wood, whereas wooden beams like the ones the authors are dry and therefore more susceptible to fractures. "This is not the proper experiment to show [what] is occurring" inside the tree, Moulia said, "because you have to avoid this additional cracking." Brian Kane, an arborist and professor at the University of Massachusetts in Amherst, also noted that the physicists' model applies less well to open-grown trees like those in a city or park, which have larger, more exposed branches than forest trees and therefore often break at lower wind speeds. "If you asked a hundred arborists whether this paper is meaningful, most of them would probably say, 'It doesn't seem to agree with my reality,'" he said. The model is a first step, Ponomarenko agreed, and could be modified to include factors like how densely trees grow in a forest, and the fact that trees' trunks are usually wider near the base than higher up. "You can take our model and add a lot of realistic factors to it," he said. And that, added Gardiner, is how progress will happen. "When you combine the complexity of biological systems with the simplicity of physical systems, you can really make advances." The paper appears in Physical Review E.